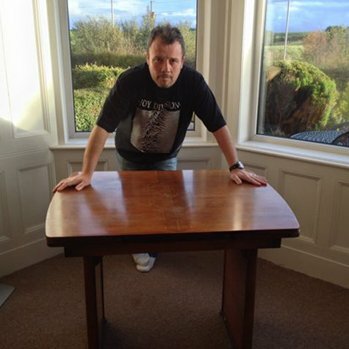 Ian Curtis’ kitchen table has sold for £8,400 on eBay. The Joy Division singer’s old furniture went up for sale for eight days on the popular auction site, and now the table has sold for a price the seller describes as ‘crazy’. Terry Harrop, 51, bought the table seven years ago for just £100 from Ian’s former neighbour Dorothy Bentley Smith, who bought the singer’s house on Barton Street and ran it as a Bed and Breakfast after his death. And Terry, from Annan in Scotland, says his decision to sell the furniture has not been popular with everyone. IT business owner Terry says former members of the iconic band and Ian’s family issued a statement to music magazine NME condemning the sale of the table. It read: “Joy Division original members Bernard Sumner and Stephen Morris would like to lend their voice of support to Deborah and Natalie Curtis, who have been caused great distress over media reporting of the sale of the table originally owned by the family, and currently being auctioned on eBay. “Deborah and Natalie would like to point out that the sale of this table has nothing whatsoever to do with them. But Terry, who is selling the unique item so that he can buy equipment to record music with his band Always the Way, says that he listed the item in good faith. He said: “Everything’s been terrible since it went up on the site. I do feel I have been persecuted in the press and would like to tell my side. “I thought that selling the table to raise money in order to make more music was a good thing, I\’m not doing it to make a quick buck and never knew it would get so much attention. “To think that it has ended up been sold for so much is crazy. “The table was offered back to the family seven years ago just before I bought it and they did not want it back. All I have done is put it up on the site, I don’t think I have done anything wrong. The highest bidder lives in Canada and Terry says he has no clue how the buyer will get the table there. via Joy Division singer Ian Curtis kitchen table sells. – MacclesField Express. Is this table the last surface he stood on before… y’know, stepping off this mortal coil? In which case, yeah – macabre! (Where does Peter Murphy’s toaster come in? Did he try electrocuting himself in the bath, or something?) Has Kurt Cobain’s shotgun been put up for grabs yet? Peter Murphy’s toaster was my (clearly poor) attempt at humour!